Promotional photo for CCHS’s fall production of The Diary of Anne Frank. The Cathedral Catholic High School drama department will present the opening night of The Diary of Anne Frank tonight at 7 p.m. in the Guadalupe Center. 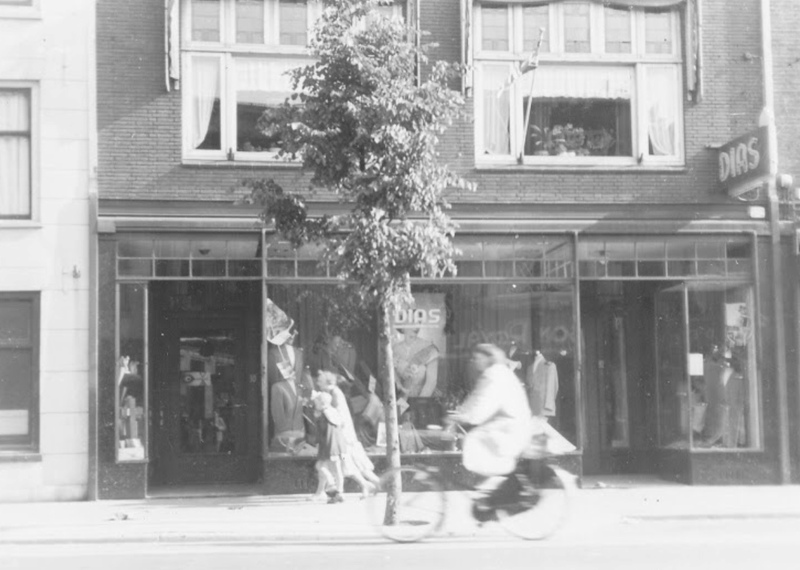 In the town of Utrecht, Netherlands, Mr. Emiel Lopes Dias and his family lived above their family-owned store until the Nazis took over the business at the beginning of World War II. Imagine living in a world with such great evil that children are pulled out of school and forced into hiding and sometimes transported to torturous concentration camps. This was the reality of countless innocent men, women, and children killed solely for their Jewish faith. Mr. Emiel Lopes Dias, grandfather of Cathedral Catholic High School student Lauren Leonard ‘20, experienced these dark times of World War II. He lived in the small Netherlands town of Utrecht, located only 22 miles from Amsterdam where Anne Frank and her family went into hiding. Mr. Dias, half-Jewish, was pulled out of his elementary school during the war while his Jewish father hid from Nazi forces for a year. When the Holocaust ended, Mr. Dias was 13. He continues to grieve the lost lives of his school friends, uncles, aunts, and cousins. CCHS students, including Leonard, will honor the victims of the Holocaust through the inspiring production of The Diary of Anne Frank on Nov. 16 and 17 in the Claver Center. “Anne’s story is one that should not only be read about, but also seen and understood visually,” CCHS drama department co-producer Miss Kelle Webb said. Frank, played by Amelia Devins ‘20, was born on June 12,1929 in the German city of Frankfurt and fled to the Netherlands with her family as Adolf Hitler rose to power in Germany and threatened their lives. Anne and her family hid from Nazi forces in a secret annex in Amsterdam for more than two years, where she wrote down details of her experiences, thoughts, and feelings in her diary. The Diary of Anne Frank is the most widely read firsthand account of the Holocaust, according to biography.com. The cast of The Diary of Anne Frank visited the Anne Frank Exhibit at the Museum of Tolerance located in Los Angeles in October to learn more about the Holocaust, gaining awareness of the emotions behind the events they would be performing. At the beginning of the museum tour, each student received the name of a Jewish child and followed that child’s Holocaust experience. At the end of the day, students were given the harsh news of the children’s outcomes. “This made it all very real,” CCHS drama teacher and director Miss Katie Wilson said. “It is one thing to know these people lived, but each of us having a story which we were personally attached to for the day was very powerful and emotional. Leonard was particularly touched by the visit due to her strong familial connections to the Holocaust. Leonard’s great, great grandfather died at a concentration camp, along with 150 other of her family members. “The whole background [of the Holocaust] and Anne Frank’s story means a lot to me and my family,” Leonard said. Miss Wilson believes that the emotions stirred up during the cast trip not only put a very real face to the Holocaust for the students, but will also improve the overall production. Miss Frank’s touching story, filled with messages of strength and hope, not only inspires the cast, but continuously inspires people of all ages around the world. “Our amazing young cast has been able to represent what Anne’s story is about: love, family, religious freedoms, and being true to one’s self,” Miss Webb said. The insight and optimistic understanding of life Anne possessed at the age of 15 has reached people in over 60 countries with over 30 million copies sold. The Diary of Anne Frank inspires many, especially the youth, to strive to leave a positive imprint in the world. Miss Webb stresses the importance of not only remembering the strength of innocent Holocaust victims, but also learning from this horrific history. Keeping the memory of the Holocaust alive ensures that the world will never forget the evil of World War II, and that it will continuously honor the tremendous strength of the survivors, such as Mr. Dias’s. “[Mr. Dias] inspires me a lot because he has been through so much more than the average person, and I must remember to deal with life and to be strong,” Leonard said. Kelsey Lyons ‘20, Mia Devins ‘20, and Maximo Nichols ‘22 rehearse a scene as their three characters have a conversation in Anne’s room, helping to lighten the mood of the play as a whole. 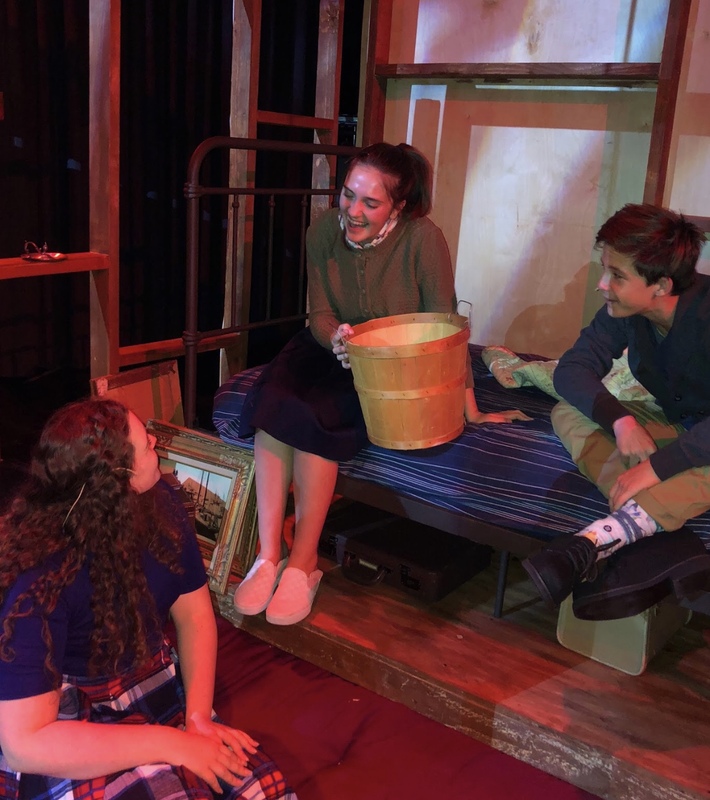 While passionate about theatre, lead actress playing Miss Anne Frank in the Cathedral Catholic High School drama production of The Diary of Anne Frank, Mia Devins ‘20, never planned on originally auditioning. 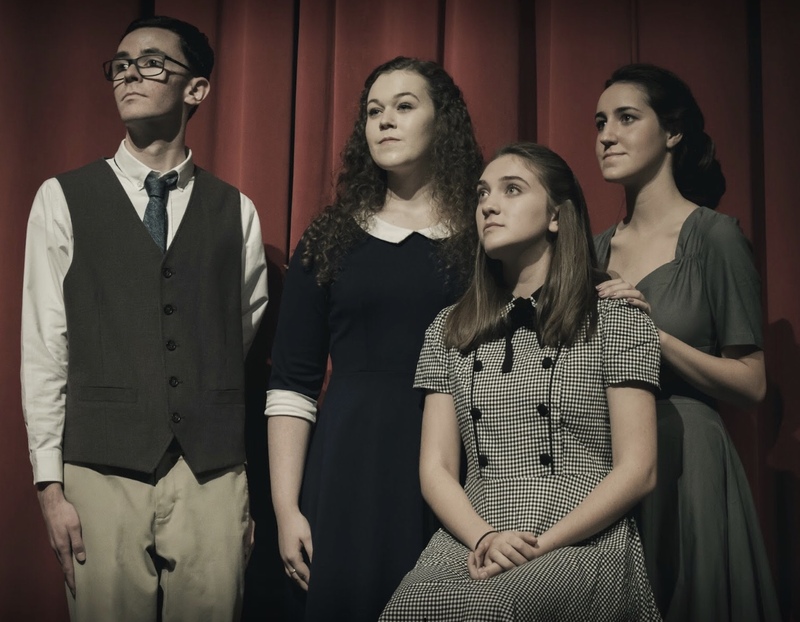 The CCHS drama department’s fall production details the events of Miss Frank’s real diary, documenting her family’s experience as Jewish people hiding from the Nazi’s during World War II. Having to adapt to the reality of playing historically accurate people, the smaller cast of 14 main members has had time to bond in order to best fill their roles. Beyond a basic overview in history class, the actors took the responsibility of educating themselves about the real life people behind the script. During the time the cast rehearsed and played with character depth, the rest of its surroundings and design of the stage was being worked out by the drama tech department. The crew, taking on a large roll for the eventual schoolwide shows, designs and builds sets, supplies and moves props around the stage, takes care of hair and makeup, and sells concessions to the audience. As people grow through the drama department, the dynamics of the cast change and grow as well. The CCHS graduating class of 2018 incuded students who have been a large part of the shows for multiple years, making this year a unique time for younger actors to shine. The play’s lead cast is not only composed of rookies, but also of returning faces, such as Maksil Lorenzo ‘19, the lead in the CCHS 2018 fall production of Dead Man Walking. While it might be looked upon as a scary and stressful process, actors must adjust themselves to the prospect of auditions for each and every play. The process consists of actors preparing a monologue, going through callbacks, and reading with different people so Miss Wilson can cast the roles. Lorenzo, a seasoned contributor to the drama productions, no longer sees auditions as a stressful time, but rather something to enjoy. “I actually manage to make the process harder for myself,” Lorenzo said. “I write my own monologue based on the type that Miss Wilson requests which is not at all necessary. Similar to any sport, the motto “practice makes perfect” applies to the actors and the crew of drama tech as they must properly prepare the show for the final performances. Rehearsals are nearly every day after school for a few hours, in which the cast runs through lines and scenes to fulfill the vision Miss Wilson has of the show. This practice does not include the homework of memorizing and practicing lines, according to Devins. Drama tech stays hours after school as well, having to build each aspect of the set from a design by Mr. Matt Herman, who currently works on broadway. The passion put into the production will be on full display when the play opens on Nov. 16 at seven p.m. in the CCHS theatre.